Mazda model offers "motoring thrills"
Motorists looking at buying a car so they can enjoy the wind in their hair this summer may be tempted by the latest offering from Mazda. 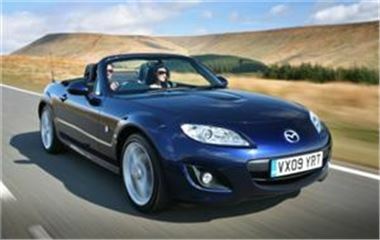 The 2009 MX-5 has been given a facelift and the manufacturer claimed the vehicle's new look brings it in line with other models from the company's range such as the RX-8 R3. Available in soft-top and roadster coupe editions, the car also offers better green credentials than its predecessor. Carbon dioxide emissions from the 1.8 SE version of the model have been reduced from 174 g/km to 167 g/km. Mark Cameron, Mazda's sales and marketing director, said: "The latest exterior, interior and technical upgrades to the 2009 Mazda MX-5 range will ensure that the soft-top will continue to offer pure, fun-to-drive, open-top motoring thrills." Alternatively, motorists who are keen to update their current car but do not fancy the MX-5 may want to check out the new Mazda3, which is due to be released in May.